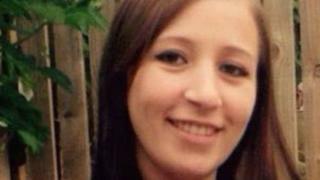 A man accused of murdering his wife beat her while she was pregnant, a court has heard. Akshar Ali, 27, was described at Leeds Crown Court as a "woman beater" who had a history of domestic violence against Sinead Wooding. Co-accused Yasmin Ahmed told jurors Ms Wooding had shown her bruises on her body caused by Mr Ali. Both deny murdering the 26-year-old, whose body was found dumped in woodland, at Ms Ahmed's home. Ms Wooding had been beaten with a hammer, stabbed six times and set on fire. Giving evidence at the trial, Ms Ahmed described Ms Wooding showing her injuries. "Ali had hit her. One day he beat her up and he wasn't satisfied so he opened up the kitchen cupboard and whacked her on the head," she said. "She didn't deserve a beating. She was pregnant at the same time." Questioned by her defence counsel, Tahir Khan QC, Ms Ahmed said mother-of-four Ms Wooding, 26, sometimes retaliated. On one occasion she pushed Mr Ali down the stairs of their home. She recalled: "I laughed. It was about time she got her revenge. "I told Sinead to leave him. [The relationship] was more down than up. I don't like woman-beaters. "If she had suffered any bruises at the hands of Ali she would ask me to take the children to school because she was embarrassed to show the bruises to anybody." Mr Ali, 27, of Scott Hall Road, Leeds, and Yasmin Ahmed, 27, deny murdering Ms Wooding at Ms Ahmed's home in Reginald Mount, Potternewton, Leeds. Mr Ali's mother Aktahr Bi, 45, denies assisting an offender by procuring a vehicle and assisting in the disposal of Ms Wooding's corpse. His brother Asim Ali, 21, also denies assisting an offender by procuring a vehicle and assisting in the disposal and burning of her body. A fifth defendant, Vicky Briggs, 25, denies assisting an offender by helping clean up and burn material after the murder.